A year ago, a pregnant lady named Aishath Fariyal, 33, was died at IGMH after she was brought from HDh. 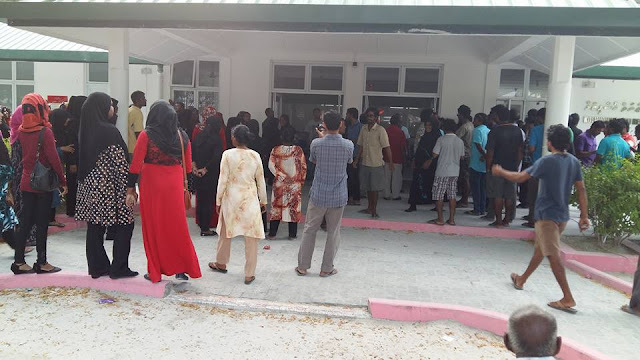 Kulhudhuffushi Regional Hospital due to excessive bleeding after her cesarean there. It was reported then that her life could have been saved if the hospital was appropriately equipped. Her death resulted in unrest in Kulhudhuffushi, where people raised their voice against lack of provision of appropriate healthcare in the northern hub. Police controlled the crowd. Police Presence was required yesterday due to the Absence of Qualified doctors and facilities. Police presence won't be required tomorrow when we ensure that all people are served alike irrespective of their region of residence. Unfortunately, our politicians were afraid of Decentralization and keep overconcentrating on the Greater Male. Believe it or not, the country is falling apart due to rising disparity between the Urban and the Rural population.